02-Jul-2016 It lasted just 15 minutes, not unlike the Battle of Prestonpans! 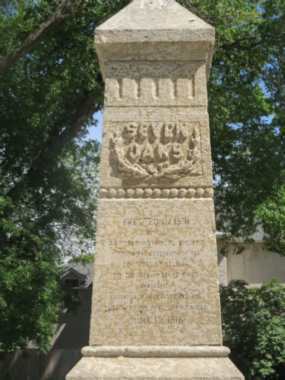 Ironically, the memorial had been neglected of late but the coming of the bicentennial commemorations has ensured considerable restoration and interpretation led by the local school. 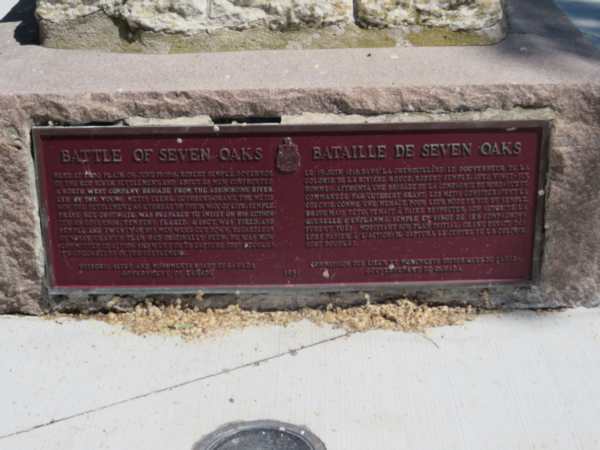 It was a short but defining skirmish really between the Metis fur traders [backed by the North West Company] and Lord Selkirk's Red River Settlers [backed by Hudson's Bay Company]. The former relied on the fur trade and trade in pemmican, dried bison meat. Lord Selkirk's Settlers wanted the pemmican supplies kept entirely for themselves whilst they established an agricultural settlement. 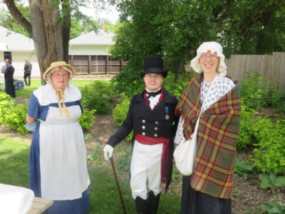 The Metis were victorious in the battle and the Red River Governor Semple was amongst the dead. 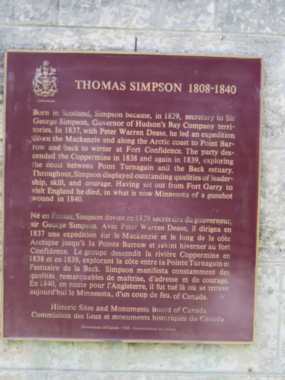 In defeat the Settlers fled south until Lord Selkirk could return to negotiate a treaty with the local First Nations Chiefs. The subsequent merger of the North West and Hudson's Bay companies meant Selkirk's Settlers could resume their lives at Red River. 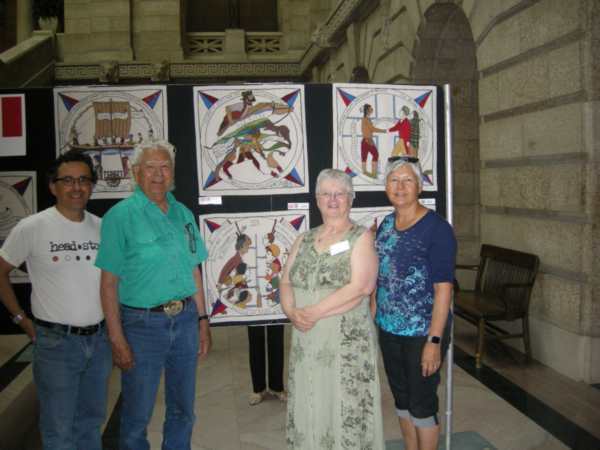 Lorraine Iverach [pictured below right centre] reports: "This afternoon, Saturday 18th, a Metis family group were looking at the tapestries and I went over to give them some background about the project. 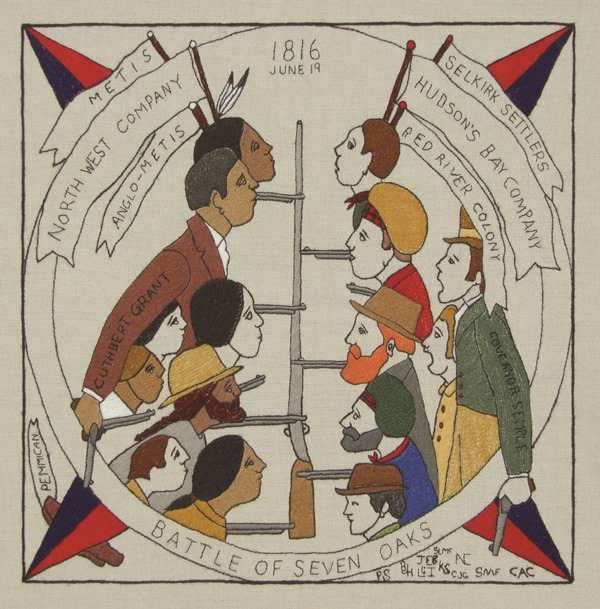 As we chatted I mentioned that one of the Manitoba Tapestries Panels was about the Battle of Seven Oaks and that Sunday June 19th will mark the 200th Anniversary of that event. 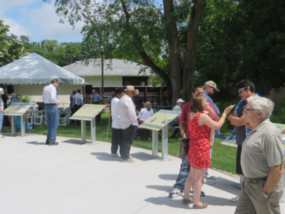 They shared that they were from Alberta and had in fact come to Winnipeg to attend those commemoration activities. "I was flabbergasted! Clearly we were cousins or something, all descended from John Pritchard! "It turned out this family are descendants of William Pritchard, the son of John Pritchard and his First Nations country wife, Marie. 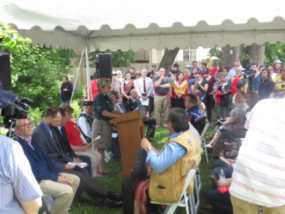 They are also descendants of Cuthbert Grant, the Metis leader in 1816 so they had ancestors on both sides of the battle. "Their last name is Wells: Herb Wells is the great-great-great grandson of John Pritchard and Marie, Lane Wells is the son of Herb, and Julie Graff is the daughter of Herb. "We concluded we are the descendant families from John Pritchard's country wife and the church wife". 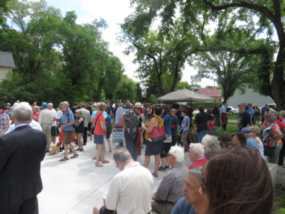 A great crowd began the commemoration at the Memorial seen below, followed by a Service of Reconciliation in St John's Cathedral ... then a fine evening in St John's Park.